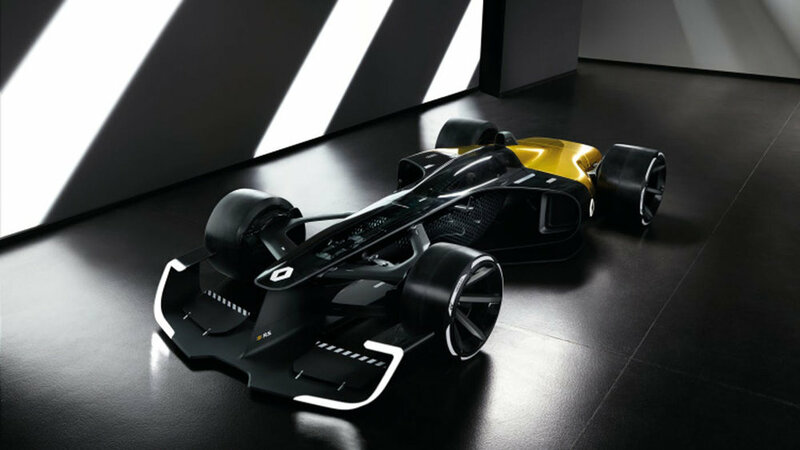 Just a few days ago, Renault unveiled its vision for the future of Formula One in ten years with the R.S.2027. Like countless of other Formula One concept, it’s radically different from the machinery that we see today on the track. Interestingly, Renault is just the fourth team to unveil a future Formula One concept. Previously, Red Bull, McLaren and Ferrari had all released their future visions for the sport in past years. Each concept has its own philosophy and design for the future of Formula One. With the four concepts, we may have a closer look, into what Formula One can look like in the near future. The 2017 rules are just the beginning in Formula One as it is now creating some of the most complex cars in the history of the sport. The 2017 rule changes are certainly a good start into the new era. What we see in the concept is that the future is certainly open. Especially with Liberty Media and FIA looking to push Formula One forward for the new generations. The Red Bull “X” Series is a group of concept car designed and created by “Design God” Adrian Newey for the acclaimed Gran Turismo series on the PlayStation since 2010. Although never been planned as a Formula One concept, its designs are based closely on the technology of the sport. Initially, the concept of the X2010 was based on a low air resistance, single seater covered wheel prototype. A “wing car” powered by a forced induction engine producing 1479 HP (3000cc V6 twin turbo), aiming to achieve a top speed of over 470 km/h (292 mph) and a maximum lateral force of 6Gs. Newey later included the addition of fan car technology, a long-time dream he held as a racing designer which has famously been an integral part of the Chaparral 2J and the Brabham BT46B. The benefit of a fan car is that it pulls air out from underneath the car, creating an area of comparatively lower pressure. This difference in pressure above and below the car presses it towards the ground, producing downforce. The fan principle allows the X2010 to maintain a high cornering speed in low-speed corners. After evaluation of the technology going into the car, the X2010 was redesigned incorporating refinements advised by Newey. The car has a full glass canopy and full wheel cowlings which permit very low air resistance. Downforce is gained in the low-speed range by the use of the fans. In the high-speed range, the front and rear wings, as well as the rear diffuser make the car reach a theoretical maximum speed of 500 km/h, with a weight of 545 kg and a maximum lateral force exceeding 8G. This spec is virtually at the very limit of what a normal human body can withstand. With the series has spawned six variants from the original X2010 to the latest X2014 Fan Car. The later versions are much complex with many small refinements and changes towards the car aerodynamics profile. Back in early 2015, Ferrari released their Formula One concept for the future as a way to influence the FIA to change the rules on car designs especially after the failure of the 2014 rules in which car’s designs are absolute “garbage” with the now infamous “finger” nose. The design has somewhat influenced the rule changes for 2017 and might be a “success” even though fans and experts strongly demanded the desired rule changes. Comparing to the “X” series by Red Bull, it looks much simpler and much more feasible to create. The design of the car took some cues from Dallara’s DW12 chassis (IndyCar) as well as the Spark SRT_01E (Formula E). Ferrari's concept looks extreme but the most feasible to achieve out of the four concepts. The design of the car is much more exaggerated than the Dallara’s chassis for aerodynamics purpose. It includes rear fenders that connect to the rear wing. The front wing includes fenders and two top winglets that connect to the nose cone (similar to the new Formula E front wing designs for this current season). Unlike Red Bull, Ferrari interestingly didn’t include any head protection canopy but sticks to the open wheel / open cockpit philosophy. The performance isn’t known since the car is only a rendering on how Ferrari envisions the future of Formula One. But we can assume that it most likely will be a bit quicker than 2017’s new breed of Formula One cars. After enduring a massive blunder in their first year partnering Honda again in Formula One in 2015, McLaren thought it would be fun to create a Formula One concept as well, as Ferrari did it at the early stage of the season. Strikingly, the car looks really similar to the X2010 designed by the Bulls from Milton Keynes, in which Red Bull also poked their rivals from Woking on Twitter for fun. From the outside, both cars look almost identical, but underneath the skin, the McLaren is the most ambitious concept to attempt out of the four presented here. The MP4-X concept is more like a fighter jet on wheels. The MP4-X includes things that you can only think of in the future, but in fact, they are in the early stage of development for future uses. It seems far fetched, but these innovations might actually be feasible in 15 years, with technology that -one would think- belongs to a fighter jet rather than a Formula One race car. The concept also introduces active aerodynamics with moving winglets to keep the car's performance optimal on any circumstances. With systems such as tire sensors that can predict tires delaminating, solar cells, 360-degree head display, using brain patterns to control systems and SO MUCH MORE. It can only be said that this might sound overly crazy, but it may be absolutely relevant two decades from now. The car only makes an appearance in EA’s acclaim Real Racing 3 with its performance can be matched closely to the Red Bull “X” Series vehicles as well. With McLaren’s idea, it might be an interesting development for the future. No, this is not another concept car for Gran Turismo like the Red Bull "X" Series as you might think with the word "Vision". It actually is Renault's vision for Formula One in ten years with its simple yet also interesting design. The concept was unveiled at the Shanghai Motor Show last week and has been the talking point of the Formula One's world for the past couple of days. It isn't as cluttered as the three previous concepts and is a refreshing take on how Formula One cars can look a decade from now. The concept from Renault somehow looks simple yet intricate. The concept features active aerodynamics. The rear wing is fully retractable, much like those seen on high-performance road cars today, replacing the controversial Drag Reduction System. Meanwhile, at the front, Renault's wing closely follows Ferrari’s solution but uses a single pylon (same with the Footwork FA12) which acts as a keel for the suspension wishbones to attach to. It also attaches to the floor, which extends along the length of the nose to ensure predictable airflow underneath the car. While two flaps on the front wing assembly act as active aerodynamics. The car is still powered by a turbocharged hybrid V6 like current Formula One cars but with more punch with more than 1300 hp with the car only weighs 600 kilos, with the KERS output now up to a staggering 500 kW. It also features all-wheel-drive with an electric motor out front (although Lotus spectacularly failed with the Lotus 63 and its four-wheel-drive layout) and four-wheel-steering as well. Informational LED lighting will also be featured, like series such as WEC or IndyCar, but will be displayed on the wheels. Lastly, Renault also follows suit with Red Bull and McLaren on including a transparent canopy for head protection. All four concepts are interesting in their own rights, and it may be interesting on how they shape up the future. It can be said that all four concepts create a pattern for us to see what the future of the sport will shape up to. Each concept has different ideas, and each has their own philosophy. Formula One is at the point where they will have to do something drastic for its future as a way to attract more fans as well as keeping long-time fans to continue to follow the sport. Formula One is the highest peak of motorsport, but with the slow rule changes and sticking to an outdated philosophy, Liberty Media and the FIA will have to work on their hand, but it looks like we are on the right track at this time. The future: anything can happen. All of these concepts are plausible, and it is going to be interesting to see what could be implemented in the future.